Seachtain na Gaeilge was established as an event to highlight the use of Irish in everyday life. It was an extension of Lá Mór na Gaeilge, which was centered around St. Patrick's Day and was primarily directed at schools and young people in general to enclurage them to use Irish outside school. 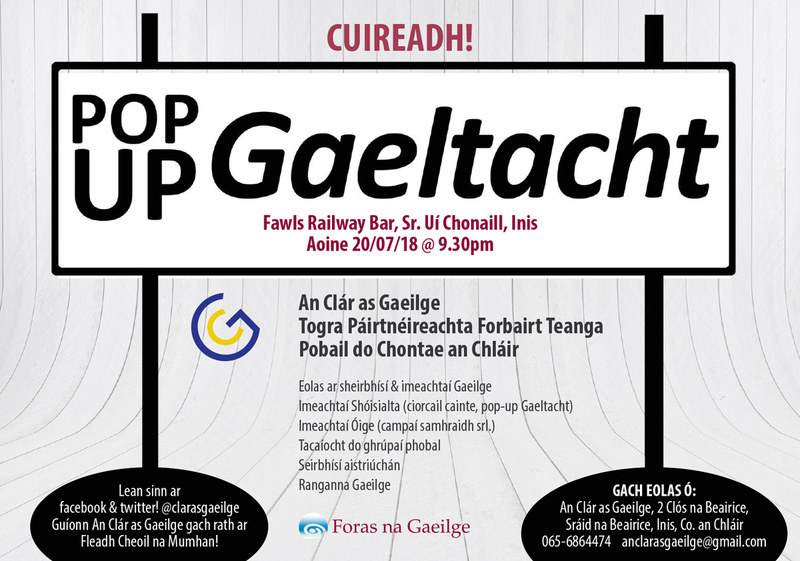 Since then, Seachtain na Gaeilge has grown and developed into a National Festival of Irish Language activities catering for all tastes and age groups. 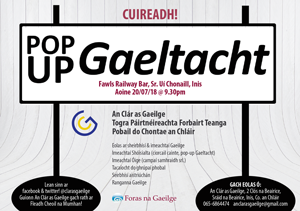 It is organised on an County by county basis and is co-ordinated in each County by the branches of Conradh na Gaeilge, under whose auspices it is run nationally. With events ranging from simple conversational evenings to street céilís; speed dating to wine tasting, it gives everyone a chance to experiment with Irish whether fluent from youth or just taking btheir first steps in conversational Gaeilge! Organisations, local councils, schools, libraries, music, sporting & cultural bodies all register their Seachtain na Gaeilge events with us and a Programme of Events is then published in co-operation with the Irish Office of Clare County Council covering events all over the County.